Amazing views from this Ancaster 47 Acre residential/agricultural zoning. Enjoy peaceful country lifestyle on spectacular triangular shaped flat parcel with 3 road access. Great for new development. Custom Built 4000 SF Brick House features 3 large bedrooms and office/sitting area on second level, large eat in kitchen with granite countertops & family room, separate living room and dining room on main level. Main floor laundry/mud room with access to garage and basement. Lovely deck from kitchen to have your morning coffee and enjoy the beautiful view. 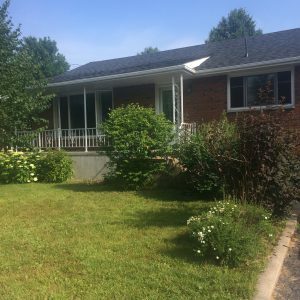 900 sq.ft finished basement apartment with separate kitchen, washroom, cold room and separate entrance. Attached 2 car garage. Outdoor parking for 15 cars. Natural gas, well and septic system. Brand new central vacuum system. Close to Hwy 403 access at Hwy 52. Close to many shopping plazas in Ancaster. Children picked up by school bus. Excellent opportunity – many possible uses. Book your private showing. 3% commission to Buyers Agent.